For most, Memorial Day is synonymous with picnics, pool parties and, most importantly, grilling. But no matter how good the burger and potato salad (the better-for-you version of course!) taste, you always need something refreshing to wash it down. For most, Memorial Day is synonymous with picnics, pool parties and, most importantly, grilling. But no matter how good the burgers and potato salad (the better-for-you versions of course! ), you always need a refreshing drink to go with them. That's why you need to try this recipe for Pressed Watermelon and Basil Water. Light and refreshing, it's hard to believe this delicious sipper is less than 50 calories per serving! Another great reason to make watermelon a staple of your summer diet--it’s a powerful superfruit. 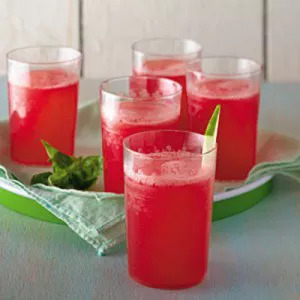 Watermelon packs more lycopene than tomatoes and is a great source of vitamins A and C. So make a cup of this Pressed Watermelon and Basil Water and sip your way to good health this weekend.